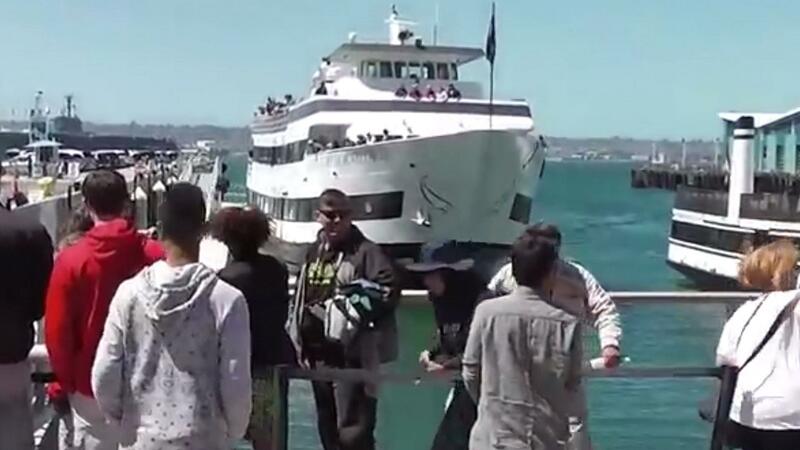 Three people were hospitalized Thursday after a 150-foot tourist boat smashed into San Diego's downtown waterfront in a collision that was caught on video. The Adventure Hornblower plowed into the walkway of the city's Embarcadero harborside at 12:55 p.m. (3:55 p.m. ET), the Port of San Diego said in a statement. The ship could be heard repeatedly sounding its horn as it approached the dock. One woman with a walking stick had to be helped out of the way after another onlooker warned: "Get that lady outta there!" The vessel, one of a fleet operated by San Diego's Hornblower Cruises & Events, is equipped with three decks, four bars and a dance floor, and is used for whale and dolphin watching. Three of the 139 people aboard were injured and taken to hospital, according to the port, which added that "the incident is still under investigation."